Saundra de Montaño and Jordi Montaño-Carrera met in the Bay Area in 1995, and one year later, they were on their way to Las Vegas to exchange wedding vows. 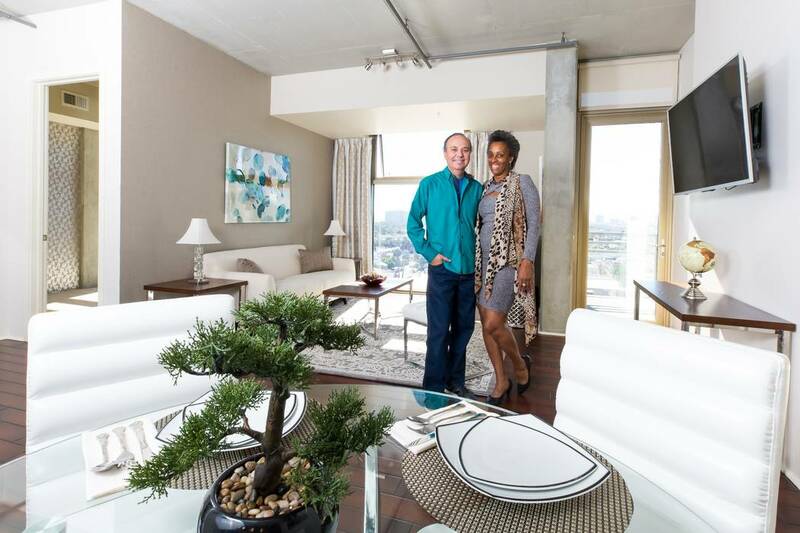 Little did they know that they would call this city home and plant roots at Juhl, a 344–residence, loft-style community in downtown Las Vegas known for its flexible floor plans and industrial chic design aesthetic. “After we got married, we embarked on a real estate venture by identifying properties that we thought would be a great part of our investment portfolio. But as time went on, we realized it was becoming more difficult to purchase homes in the Bay Area because of climbing prices. We saw great potential for our professional growth and a new, exciting lifestyle in Las Vegas and specifically, a lot of promise with Juhl and the vibrant city that surrounds it,” Saundra said. The couple became Nevada residents in 2002 and purchased a single-family home in the west part of the valley. Keeping a close watch on the real estate industry trends, the couple recognized a growing demand for furnished rentals. “We are confident Juhl’s location close to Fremont East District, unique art galleries and more than 150 eateries is the perfect enticement for renters seeking the ultimate spot to take in all that downtown offers on a short term basis,” Saundra said. Saundra and Jordi also appreciate Juhl’s exclusive resident amenities, such as its resort-style pool with cabanas, spa and fire pit, movie theater, two-story fitness center, 24-hour security and on-site dry cleaning services. “We couldn’t be happier with our decision to invest here — both for personal and financial reasons, and we are excited and honored to be a part of the continued growth of this iconic city,” Jordi said. Juhl is an urban destination and a popular residential choice for professionals and entrepreneurs, especially many who work at firms and courthouses throughout downtown’s expansive legal community. Juhl encompasses multiple buildings, including a high-rise, mid-rise, brownstones, live/work spaces, retail spaces and a warehouse-style loft building. Many of its residences can be customized via 130 unique floor plan configurations, including many that are one of a kind within the property. Homes at Juhl range from 600 to just under 2,000 square feet and start in the high $100,000s. Recently refreshed, Juhl boasts an upgraded resort-style pool with cabanas, lobby and co-op working spaces that cater to its professional residents. Hallmarks of Juhl include flexible floor plans, large terraces and floor-to-ceiling windows that maximize natural light. Private balconies, 10-foot ceilings, energy-efficient design and details, exposed concrete surfaces and mechanicals and upgraded fixtures and surfaces all combine to create Juhl’s cool urban vibe. Amenities include an al fresco movie theater; two-story fitness center with pool and Strip views; 10th-floor vino deck with Strip views, resort-style pool with cabanas, spa and fire pit; 24-hour security; gated parking structure with assigned resident parking; and full-service concierge. The community also has a summer kitchen and a nearby urban garden plot exclusively for use by Juhl residents.